AFX Mixing and Pumping Technologies Inc.
AFX Mixing and Pumping Technologies Ltd.
At the heart of every AFX peristaltic pump lies a heavy-duty peristaltic hose specially developed to work hand in hand with the pump roller technology installed in the AFX PUMP SERIES. We stock a comprehensive range of hose materials for each pump to be compatible with the unique chemical and abrasive characteristics of every application. A carefully designed and manufactured hose element is the single most vital component for the performance durability and efficiency of any peristaltic pump. To ensure a good pump you must have a good hose, and this is where AFX excels. Each hose we supply is built under stringent quality control measures, using high-quality, compounded rubbers, reinforced with four individual layers of braided nylon carefully set at optimum angles. Once cured, the outer diameter of each hose is precision machined to exacting tolerances ensuring a perfectly sized hose. An accurately sized hose ensures perfect compression, which eliminates internal slip (which reduces pump efficiency and allows for the abrasive slurries to prematurely destroy the hose). Utilising design tools such as Finite Element Analysis (FEA), backed up by physical tests and theoretical calculations, our hoses are designed to perfection – right down to the position of the reinforcing layers, the braid angles, cord thickness, and the thickness of the surrounding rubber. 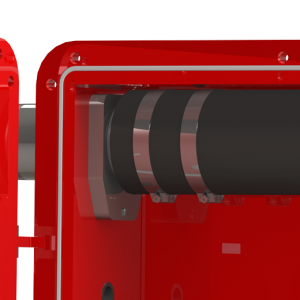 The roller geometry and the profile of the pump housing are all designed and engineered to optimise the performance of the pump hose. To ensure a good repeatable and consistent hose life, you must have a hose built and machined to exacting tolerances. To us, the ISO standards are not good enough. All our hoses exceed the requirements set out in ISO 1307 and DIN7715. So confident are we about the quality of our hose, that we will supply hoses produced to original tolerances for many of the major peristaltic pump manufacturers pumps. We have successfully reduced operational costs for a large number of customers by using our hose in their existing peristaltic hose pumps. Peristaltic pumps are by nature inherently pulsing in operation. Excessive pressure spikes and pulsations within the pump system can be extremely damaging to the pump hose and the process system. Appropriate pump selection will ensure pulsations are kept to an acceptable level. 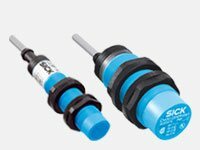 In certain circumstances where other constraints exist, it is possible to fit appropriate pulsation dampening equipment. Correctly sized pulsation dampeners and inlet stabilisers can eliminate up to 90% of pressure spikes to protect the pump, pipeline and instrumentation. Other benefits include: reduced vibration, protection against hammer, lower noise levels, increased pump efficiency and prolonged hose life. Specific details and recommendations are dependent upon each application. The primary reason for hose failure is from cyclic fatigue (number of hose compressions). Pump hose failure is inevitable, but exactly when hose failure will occur is dependent upon many factors and may not always be at a convenient time when a technician is watching the pump. Installing a Hose Failure Detector is a simple solution. When a pump hose fails, pumped product is contained within the pump housing mixing with the hose lubricant and raising the liquid level within the pump housing. The Hose Failure Detector will sense this rise in liquid level, when connected to a contact relay your system can be set up to switch off the pump or even alert a control room. The AFX Peristaltic pump range has been designed to be a robust pumping solution for high viscosity, high solids (abrasive), high density slurries and liquids for a wide array of applications and industries including mining, chemical, food and beverage, pulp and paper, petrochemical, pharmaceutical, agricultural, water treatment and many more. Building on a proven concept our latest development is the AFX PUMP SERIES which was specially adapted to further improve the product's high performance, durability and low maintenance. All AFX's products are designed to deliver exceptional performance, but what sets this pump apart from its competitors is its cost-effectiveness and reliable operation. AFX can demonstrate measurable savings when using the AFX PUMP over that of its competitors, including energy savings and maintenance downtime savings of up to 50% compared to traditional peristaltic hose pumps. The pumps are self-priming, fully reversible, highly durable, easy to maintain, can be run dry for extended periods without damage, and offer flow rates from 40 l/hr to 150 000 l/hr. Boasting eleven AFX peristaltic pump models with flow rates between 40 l/hr to 150 000 l/hr across the range the AFX PUMP SERIES have become industry favourites across many countries. We attach the same care and dedication not only to pump and hose design but also to the selection and application of our pumps. To ensure optimum performance and product life, as well as to minimise operational cost and maintenance downtime, every AFX pump is carefully selected, configured and equipped for a specific application's requirements by an experienced application specialist. The development and use of pilot plants within industries has drastically increased and become more sought after. Implementations spreading from mining processes to chemical and agricultural testing laboratories as well as personal care and pharmaceutical laboratories, the need for this equipment is on the rise. 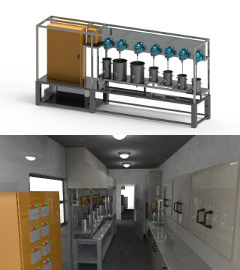 Pilot plants and bench plants are small modular industrial systems, which are designed and implemented to generate information and understand particular behaviours during test or trial periods. This is usually done before building the large full-scale plant, which entails large capital outlays as well as major risks associated with the process. The use of the pilot or bench plants enables one to make a calculated and informed decision on whether or not to move forward with the full-scale operation. It equips the client with freedom to run tests accurately as well as change and modify procedures on the smaller scale. AFX can offer you complete operating solutions for pilot and bench plants, focusing on the projects deemed "too small" for larger manufacturers and project houses. Utilising the expertise of our engineers as well as the fine-tuned skills of our staff, we build and assemble the complete unit. We have a compulsory test run which we carry out to complete the quality checks as well as to ensure that all components, electrical and mechanical operate as they should. AFX have had successful bench and pilot plant installations in the bacterial leaching studies, liquid fertiliser processing, new product launches with personal care industries to name but a few. AFX can provide you with the peace of mind with a complete solution. Guaranteeing the mechanical as well as process design is supplied to address the required aspects of your requirement. Having had successful process testing in the past, which led to full-scale plants being built and AFX being elected as the supplier to provide the agitator and pump solutions, we are confident that we will supply the best tailor-made product for you. In applications where the induction of air / gas is required and the process goal is to achieve maximum mass transfer, AFX are able to provide the client with the necessary gas induction equipment, which works hand in hand with their agitator design. Applications of this nature are often most commonly found in chemical, pharmaceutical, environmental technology and biotechnology industries. Having a track record of successful installations as well as successful problem solving ventures, where we assisted clients with their problematic plants, AFX design and fabricate the sparging systems with their equipment to ensure that the process requirements are achieved. Using these systems in conjunction with our agitators, with their gas dispersion impellers, we avoid process issues such as impeller flooding, cavitation and vortices. AFX boast a range of specialised sparges, which have been developed as a result of the technology and processing changing and calling for measures to be taken where traditional ring sparges cannot be utilised. AFX's research and development department designed and developed an innovative non-clogging nozzle. The design was fuelled by a common cause to find a solution to eradicate wear and blockages typically experienced with the standard nozzles. These non-clogging nozzles are inserted into the process selected sparge system and are usually selected for systems which are susceptible to blockages. These spring loaded nozzles act as a one-way valve. The line pressure forces the ceramic head open, allowing the free flow of the air or gas into the process. When the air or gas flow is switched off, or interrupted, the ceramic heads return back to the nozzle, closing the air or gas line, thus preventing the slurry or chemical compounds from entering. Applications where the induction of air or gas is required and some dosing applications are ideal for the use of these non-clogging nozzles. These nozzles are adjustable and are low maintenance, as they have only a few wearing parts. The nozzles are suitable to different types of gasses, liquids and other corrosive components. The nozzles are available in varying sizes to suit the process requirements and stipulated or desired flow rate. The nozzles are suitable for both low and high pressure applications. The nozzles are manufactured from high grade stainless steel as well as the internals; the high wearing ceramic tips comprise the head. 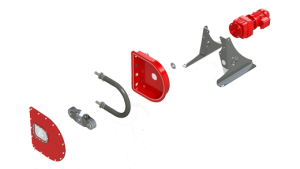 They are designed to perform well under high wear applications and can be requested in exotic type materials as well. BAFFLES are used in tanks or mixing vessels, most often cylindrical, where the product is not very viscous, but there is a large swirl or vortex being created by the mixing action. 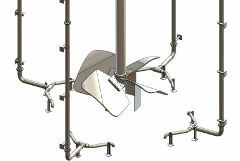 The installation of baffles promotes a much desired top to bottom mixing pattern. This flow pattern is conducive to good mixing. Baffles can be spec by the tank or mixing vessel supplier, or you may contact AFX to assist with the sizing, fabrication and manufacturing of the baffles, which can be made from a selection different steels and exotics as well. Baffles are usually not installed into very viscous processes or applications where the mixing vessels are square or rectangular. This however, does not mean that it is true for all applications. 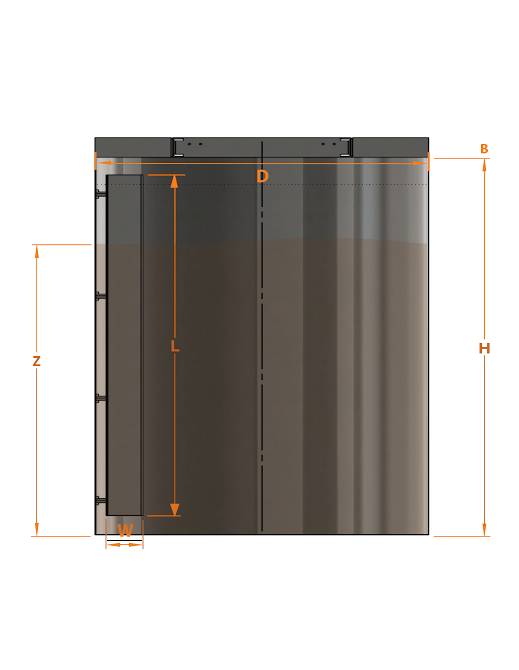 Where the processes demands are high in rectangular or square tanks, the installation of baffles will illuminate the larger fillet build up, often observed in the corners. 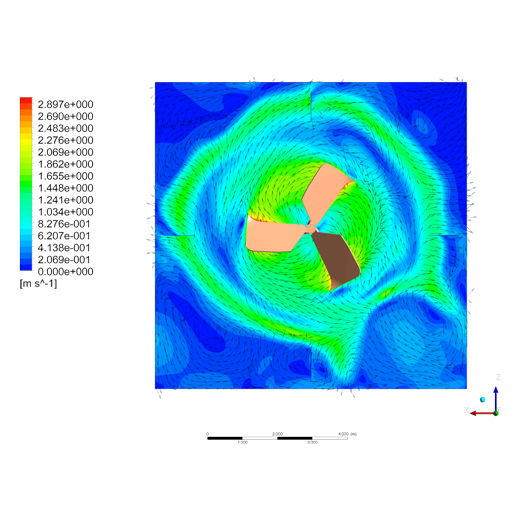 In very high viscosity applications, the materials usually do not vortex, however there may still be a large swirl component. Such applications are still required to have some baffling, and in most cases we are able to assist you with the correct baffling configuration to ensure that your process requirements are met. 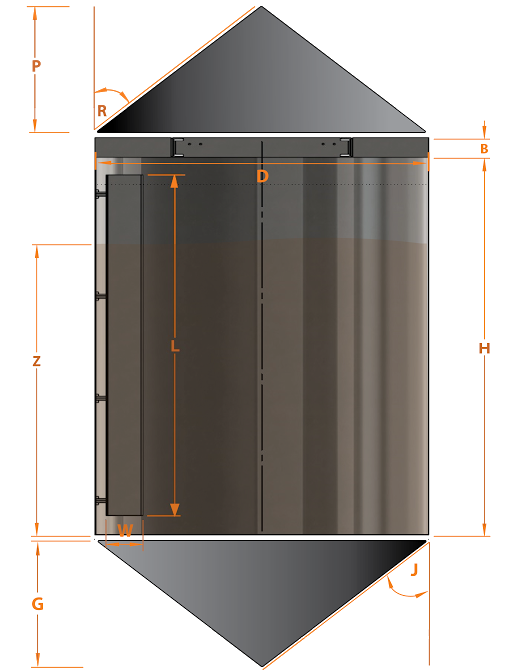 Baffle coils are used in applications where the process demands internal heating or cooling. 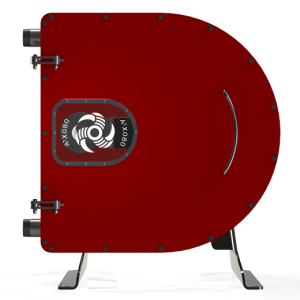 The cooling coils are designed according to the cooling / heating rate required for the process. Taking into account all factors which affect this rate, the cooling coils are then designed, appropriately sized and manufactured. 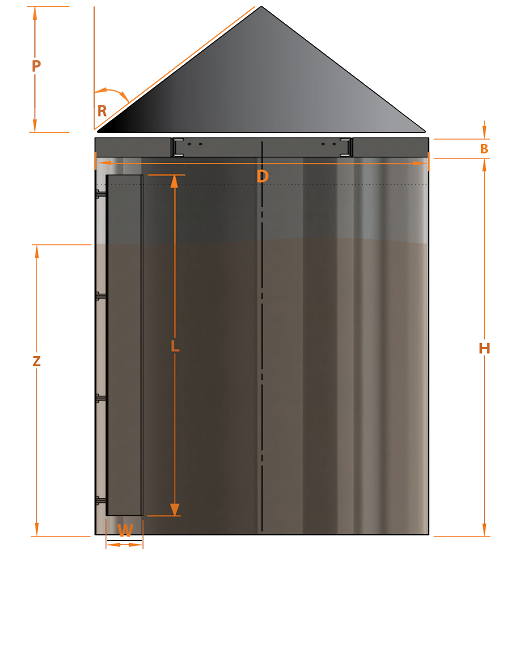 In some applications the cooling coils are also utilised as the baffles on the internals of the mixing vessel, but in applications where the cooling coils are not wide enough, the baffle will make up for the missing width. 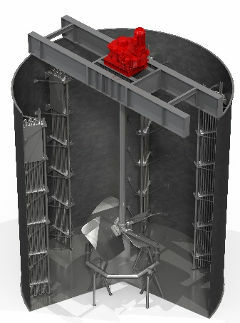 The baffles and cooling coils are one unit; where the baffle will form the last components of the cooling coil. Having worked closely and employed the expertise of one of our consultants and process specialists, AFX has been able to develop and supply cooling / heating coils to many clients. Applications spanning from agriculture where the client was manufacturing liquid fertilizers; to larger applications with bacterial or copper leaching, our cooling and heating systems provide a comprehensive solution to your desired application and process. Mounting bases and pedestals are critical in ensuring that the gearbox of the agitator is correctly aligned and mounted to the supporting beam structure. 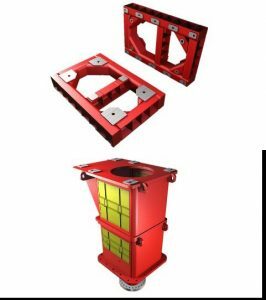 Our pedestals and bases are designed to significantly reduce the potential of twisting or flexing within the gearbox housing; which is often a common cause of some gearbox failures. Some agitator manufacturers bolt the gearbox directly to the mounting structure. This machined surface bolted to a fabricated structure often sees the stressing of the gearbox casing and of the feet, which may result in the gearbox cracking or failing. Where a processing plant is experiencing problems with gearboxes cracking or other related failures, the problems could be as a result of the gearbox being inadequately sized for the agitator loading or the gearbox being mounted inadequately. 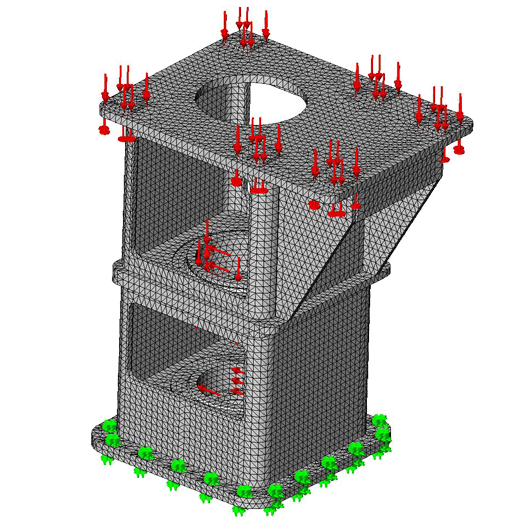 In these instances, AFX can provide accurately designed and machined pedestals and bases to retrofit existing equipment. AFX has had great success in these retrofit's particularly with a large Gold Plant in West Africa, and a major Platinum plant in South Africa. Mixing technology represents a balance between the requirements of the process and the output efficiency of the impeller within the process. Often referred to as propellers, the impellers selected for a specific agitation system are required to produce one of three basic fluid regimes: Flow (Q), Shear (H) and Pressure (P); and there is also the possibility of producing a combination of the three. This type of impeller, also known as a hydrofoil impeller, is used in applications where high flow velocity is required, and is one of the most commonly used impellers throughout our vast industry. The F3 is called upon in many applications because of its robust and efficient structure. The impeller can meet the demands of the process at lower installed power than most other impellers within the range. Widely employed throughout the various industries, these F3 impellers are used where the generation of flow determines the agitator selection. The impeller is multipurpose (by varying the blade pitch angle, one can alter the impeller’s flow and shear characteristics) and can provide high axial flow with low shear whenever required. Mining: CIL & CIP, ore (copper and gold), leaching, lime makeup and storage, solid suspensions, chemical reaction tanks, slurry tanks. Agricultural: Fertiliser makeup tanks, water storage tanks, Jojo tank mixers. Pharmaceutical: Batch mixers, laboratory mixers, homogenising reactors, pressured vessel agitators. Waste and Water Treatment: Flocculent plants, water treatment plants, chemical reaction applications. Paint & Ink: Mixing tanks, batch and blending tanks, pre-mix within 210-litre drums, large and small scale applications. Chemical Industry: IBC bin agitators, soaps, cleaners and detergent mixing, fine powders and liquid blending, household cleaning products. This type of impeller, also known as a pitch blade turbine impeller, is used in applications such as blending, high viscosity blending, applications requiring shear, and re-pulping where some flow and addition of power is still required. 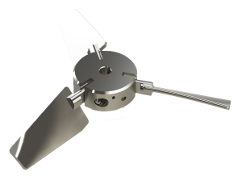 The FS4 impeller pitched blade turbine, consists of four blades and is very limited to its performance tasks within process application parameters. This type of impeller is used for applications which require higher power draw and a lower efficiency in terms of mixing. There is still a demand for this type of impeller through some applications needing high flow and some shear. Agricultural: Blending applications with some solids needing to be broken up and dispersed throughout the tank. Pharmaceutical: Lower impeller in high viscosity batch mixers. Waste & Water Treatment: Aerators, sludge tanks to break up the "cake" crud collection. 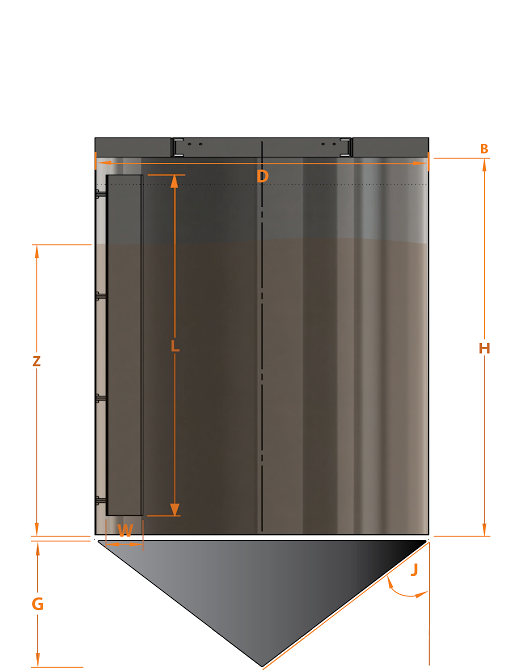 Paint & Ink: Viscous mixing tanks, batch and blending tanks, addition of solids into batches. Chemical Industry: Addition of solids into solutions where high power is required to assist with breaking down the solids. This type of impeller is also known as a high solidity hydrofoil impeller, similar to the P4 impeller but with three blades instead of four. These types of impellers are used in applications where a macro flow is required, specifically in high viscosity, low Reynolds number fluids. They are also used when effective dispersion, as well as blending and solid suspension, is required. 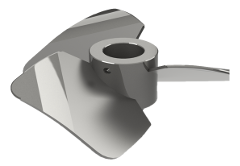 These impellers have been adopted in applications where close clearance impellers, such as scrappers, spirals and gate anchors, have traditionally been used. They are capable of blending in liquids where the viscosity is more than 40 000cP (Centipoise). Pharmaceutical & Personal Care: Shampoos and conditioners, hand wash liquid soaps, as well as relaxers (thixotropic products). Paint & Ink: High viscosity resins, high viscosity paint blends, bulk addition of solids to a viscous solution. Chemical Industry: Chemical reactions where the solutions thicken with time (anti-thixotropic). This type of impeller, also known as a high solidity hydrofoil impeller, has been designed especially for the induction of large volumes of gas. Having a solidity value greater than 90%, these impellers ensure that the gas being introduced is not able to bypass the impeller. 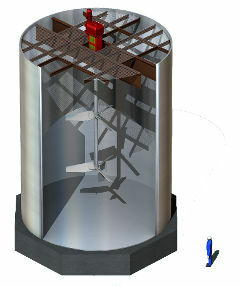 The result is increased absorbed power under gassed conditions. This is opposite to that of the Rushton impellers or Smith Turbine, both of which experience a reduction in power under gassed applications. AFX offers a broad range of unique folding axial flow impellers. These impellers have been adapted to suit applications whereby the mixing process takes place inside a vessel, which has a limited opening diameter. Before the development of folding impellers, applications such as these were approached by using impellers with fixed blades that had a diameter small enough to pass through the vessel opening. This meant that the agitator would run at speeds much higher than those whose impeller's DT ratios had been created to meet the desired specification, thus increasing the power requirements of the agitator and reducing its overall efficiency. Nowadays, as we have adapted our axial flow impellers to incorporate the moving or folding blades, we can select the impeller which would be the closest fit in terms of your vessel dimensions and application demands. These impellers provide an economical and energy efficient agitator solution suitable to your application. 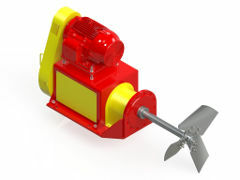 This unique radial flow impeller is designed for pumper mixer applications. The impeller discharges the fluid radially outward to the vessel wall. This particular type of radial impeller provides a more informal radial flow pattern when compared to the radial impellers that do not feature a disc. 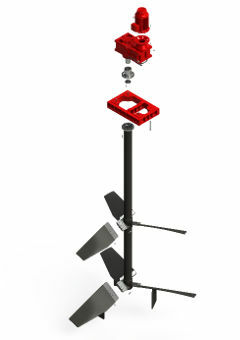 The progressive design ensures advanced flow, maximum dispersion, and provides a specified and desired head generation. 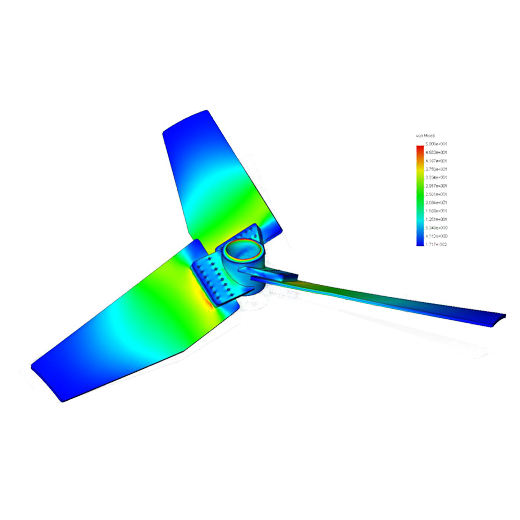 The curved blade pump turbine design assists with reduced power consumption, minimum shear generation and turbulence. Radial flow impellers are most commonly used in gas-liquid or liquid-liquid dispersion applications. AFX’s application engineers have been working alongside its R&D department in an effort to find improved solutions for wastewater treatment plants. A common problem, called "ragging", has been identified as a headache in the industry, causing many process failures and mechanical breakdowns of the agitators. Mechanical agitators are found in many wastewater treatment processes such as anoxic, anaerobic and denitrification tanks, as well as flocculation, chemical make-up, storage, sludge mixing and neutralisation and equalisation mixing tanks. “Ragging” is the collection of fibrous solids in and around the hub and leading edges of the impellers. Historically, a number of impellers have been used to achieve mixing in these processes. These impellers included the axial flow impellers, hydrofoil impellers, pitch blade turbines and radial flow backswept impellers. The axial flow and hydrofoil impellers were the most recent introduction in terms of mixing turbines in the industry due to their high pumping number (Nq) and low power number (Np). These impellers could deliver the required mixing efficiency in the tank for the process requirement, which is keeping solids in suspension. The bioreactor process is typical of this requirement, as this process requires high-efficiency mixing to avoid solids settling. 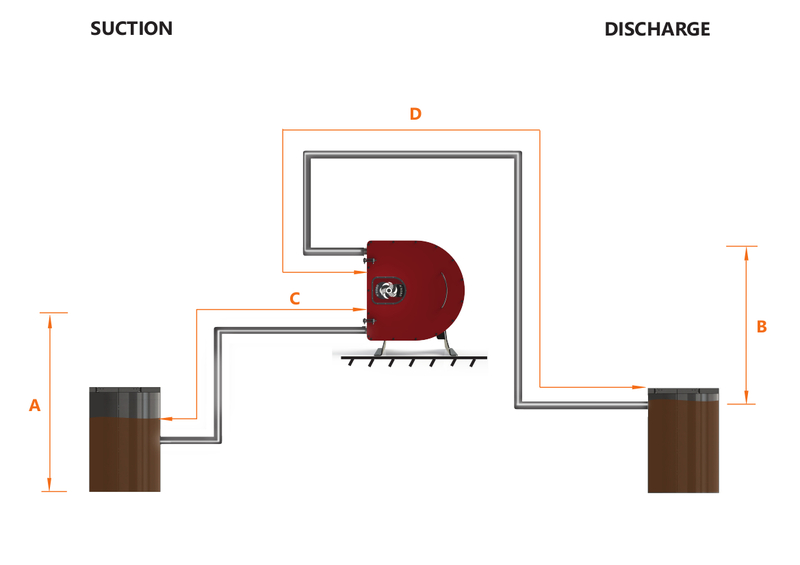 To remove the entangled collection of fibrous materials (the result of ragging) from around the impeller, wastewater treatment plants resort to reversing the mixers after daily operations and emptying the bio-reactor tanks every three to four months to manually detangle and strip the hub and impeller of the entangled mass. This is known as a fouled impeller. Rag buildup around the impeller not only restricts the process flow which results in settled solids but also increases the load on both the motor and gearbox. This increased loading reduces the expected bearing life, as well as inducing a possible motor overload, resulting in premature failure of the mechanical agitator. The most commonly found agitator solutions employ radial backswept turbines, which have a large power draw with a very low pumping/flow delivery. 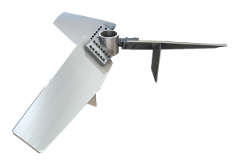 It was assumed that the backswept, curved blade design would assist in limiting the rag buildup around the turbine. 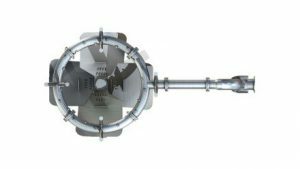 The radial flow, backswept impeller demands high power inputs to provide a marginal pumping delivery into the mixing tanks, but rag buildup still occurs around the impeller blades and hub. AFX was driven to find the “perfect” solution. 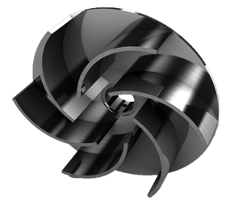 Keeping our focus on efficiency for the process demands, as well as offering cost savings to the plants, AFX developed a clean edge impeller, also known as a ragless or non-stringing impeller. 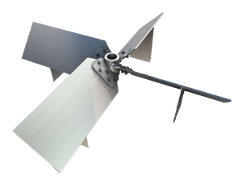 The impeller, FCE3, boasts an impressive design. Eliminating areas where common rag build-up occurred, this impeller still produces the desired output pumping rate. The FCE3 impeller ensures that the high-efficiency demands of the process are met, and provides a solution which is energy efficient. The inputted power required for the FCE3 is far less than the typical bio-reactor agitators with outdated turbine technology. The welded hub and blade design, in conjunction with the blade geometry ensures that any fibrous solids and materials that come into contact with the impeller surface are pushed over the top edge and entrained back into the high-velocity zone by the leading blade. The impeller has a high pumping number (Nq) similar to the F3 axial flow hydrofoil impeller. The power number (Np) is almost five times less than that of a radial flow backswept blade impeller. The FCE3 impeller delivers not only a solution to eliminating rag buildup, but provides you with a sound solution to the mixing process. The FCE3 impeller slots into AFX’s energy saving endeavour, providing you with the best possible mechanical solution that saves you both time and money. In-line mixers were developed to accommodate the requirements of the chemical industries where continuous mixing was required, but there were spatial limitations. In-line mixers were designed to ensure that the continuous mixing was still achieved, as well as taking into account that the mixer more than likely was required to fit into existing pipe work on the site. Using in-line mixers where there are other limitations such as capital investment, and concerns for saving in areas such as operating and maintenance costs, became a most sought after solution, solving many concerns with one application. Conventional in-line mixers provide instantaneous mixing, blending or dispersing in a small volume and at a lower horsepower per total process. These types of in-line mixers require an additional power supply in addition to that of the flowing process stream. Using this type of mixer, the retention time is usually in seconds or low minutes, as opposed to in tank mixers, which have higher minutes to hours for retention and blend time to achieve the uniformed concentration throughout. AFX specialises in the design and manufacture of static in-line mixers. This particular type of mixer is "motionless". This description provides an indication of the elements located within the pipe (conduit) part of the mixer, this, the mixing only occurs from the process stream while passing through the mixer. The in-line mixer is flanged and done so the mixer can be bolted into the existing process pipeline. Each mixer is sized to suit the application requirements, and many vary with some having as many as seven inlets for various probes and technical apparatus, other than the injectors which are used for the addition of particular chemicals or streams. In-Line mixers may also be found in the pulp and paper industry in very shear-sensitive applications. 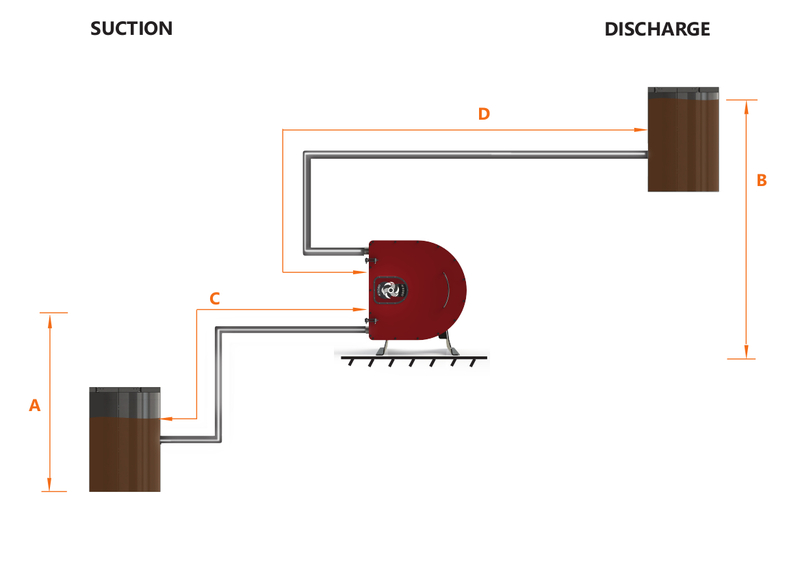 The elements within the mixer are mirror image structures strategically placed for the required mix to take place, as the stream moves through the length of the mixer. These mixers differ from supplier to supplier, but the majority are classified by their operating in flow regimes. 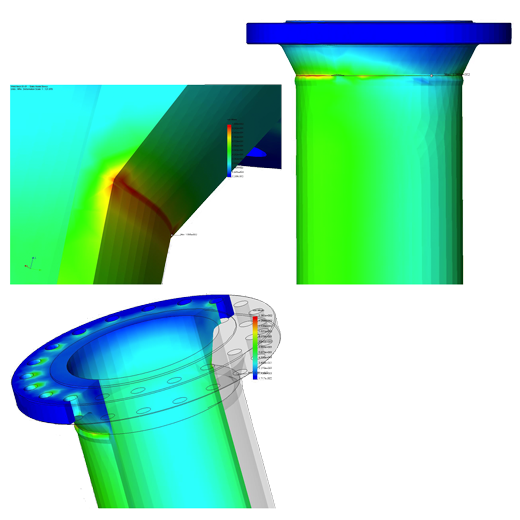 Most applications fall into either the laminar or turbulent flow, and all others usually fall in between these two. Having tried and tested a few many of the previous design means for building the internal elements, AFX has their own design which has proven successful across many broad industries, on very large varying scales; with some having an inner diameter exceeding 600mm, and to as small as 25mm internal diameter. Carefully assessing the process requirements, the in-line mixer is sized to suit and achieve the required results successfully. AFX has over 30 years' experience in the field of mixing technology. 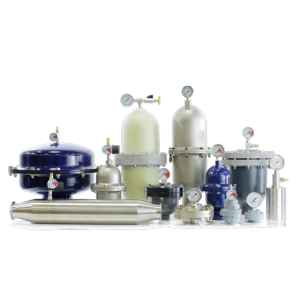 We have a broad range of quality process mixing systems and agitators to suit various industrial applications and provide solutions to all your manufacturing requirements. Pressure oxidation (POX), high-pressure oxidation (HiPOX) and ACTIVOX autoclave leaching are practical industry-standard technologies. These technologies are used to recover metals such as gold, copper, nickel, platinum and uranium. Once the metals are put into a solution, the valuable material can be recovered by processes such as electrowinning or chemical precipitation. Electrowinning, also known as electroextraction, is the electrodeposition of metals from ores that have been put into a solution by a process called leaching. Chemical precipitation, on the other hand, is the formation of a separable solid substance from a solution, either by converting the substance into an insoluble form or by changing the composition of the solvent to diminish the solubility of the substance in it. We have, over the years, supplied many agitators for autoclaves used in nickel, copper and platinum projects. AFX has supplied agitators with the P4 impeller, with a proven track record in gas dispersion, to several projects in the platinum and base metal industry. After extensive research and development work, our dual impeller agitator, the P3, and P4 combination have been installed on numerous plants. The mechanical design of autoclave agitators requires extensive knowledge of the operating conditions. Furthermore, the understanding and ability to predict these extreme forces acting on the agitator drive are essential to a successful installation. The design needs to accommodate these factors and protect each component to eliminate any failures. At AFX, we have design programs incorporating this experience that ensures reliable, well-engineered agitators for high-pressure applications. Large volumes of gas are injected into the vessel-reactor through some type of dispersion unit, be it a sparge ring or pipe. Impellers for these applications must be carefully selected to prevent flooding of the impeller by the gas, and to ensure effective dispersion, blending and solids suspension. The mechanical design of these systems is often complex, with the agitators seeing large fluid forces and consequential shaft deflection. AFX has many years' experience in the process and mechanical design of these agitators. The impeller of choice is the AFX high solidity P4 impeller, providing efficient operation at high gas induction rates. 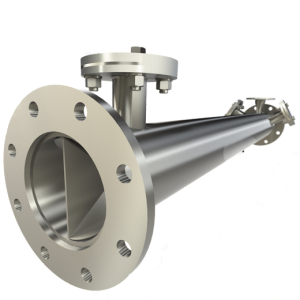 Gas dispersion applications include bio-oxidation processes (bacterial leaching) and dual impeller technology. The lower impeller, known as the P4, is a downward-pumping, four-bladed, high-solidity hydrofoil impeller that has become the standard in bioleach reactors. 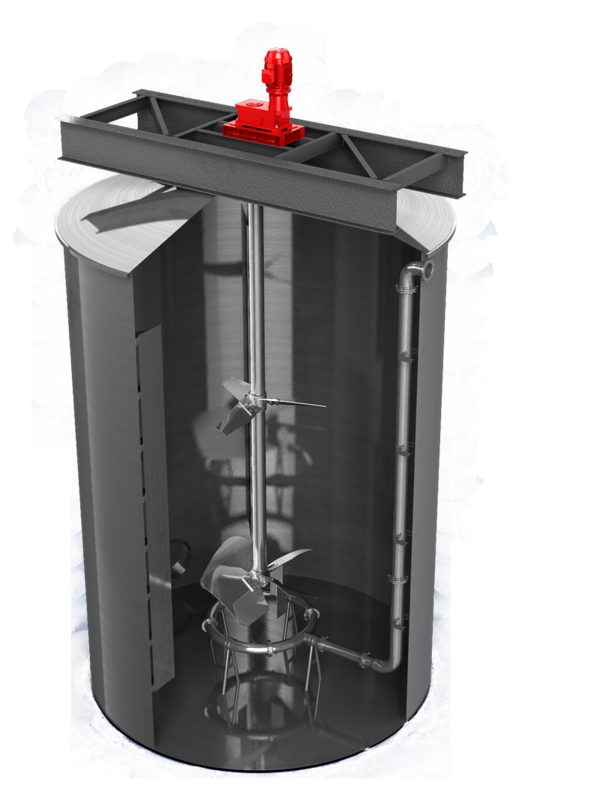 It is designed to disperse high volumes of air, while also maintaining the solids in suspension and promoting heat transfer. Such impellers, which typically have a solidity ratio of more than 90%, are characterised by their ability to operate at high gas volumes without flooding. The upper impeller is the innovative aspect and is an upward-pumping triple-blade-medium solidity impeller. This impeller, known as the P3 impeller, was originally designed for high-viscosity applications, but the diversity of the P3 impeller to operate through three-phase or gas-liquid-solids applications have also been realised. The oxygen mass-transfer requirements of the BIOX® or bioleaching process will be satisfied at a lower power input and aeration rate when compared to the previously established single-impeller system. The improved mass-transfer performance is achieved through surface air induction created by the top impeller, which is further enhanced by the gas hold-up from the specific mixing pattern created by the dual-impeller configuration. The air induced from the surface by the dual impeller installation results in the reduction of blower capacities and therefore results in blower power decreases. In addition to the improved process performance, the dual-impeller system also demonstrates a reduction in a bending moment, torque and thrust, which will extend the mechanical life of the agitator. 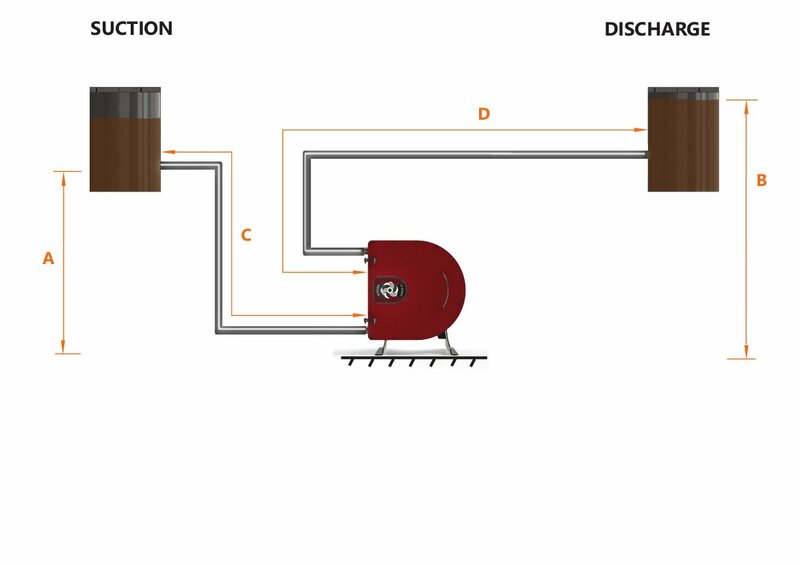 The iron is removed through a selective precipitation process of the ferric iron at a controlled pH level. After the initial metal leaching process, the iron is present as ferrous iron, and an oxidation step is introduced to oxidise the ferrous iron to ferric iron for removal before precipitation. For this process, the oxidation is done through the introduction of large volumes of air in the presence of sulphur dioxide. 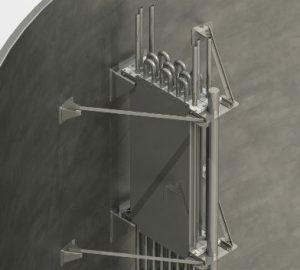 For handling large volumes of air, the conventional ring spargers that are fitted below the impeller could result in flooding of the impeller and reduced efficiency. 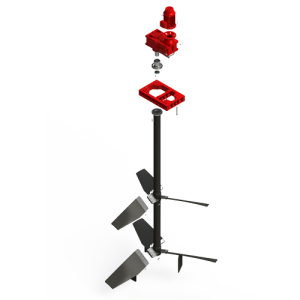 AFX has developed the eight-point bull horn sparger to handle high volumes. On a typical ring sparge, the impeller would flood around 7% of the impeller pumping capacity. With this system, that number is increased to over 20%. This sparger is low maintenance and can handle high gas rates. In the application, air is being used as a carrier gas for the reaction. Gas is injected downward towards the floor of the tank, and as the gas begins to rise, so the agitator draws in the gas and holds it down. Unlike conventional ring sparges, the gas bubbles are not that fine when they are injected into the mixture. However, this is compensated for by the large gas hold up from the impeller and sparge combination. Therefore, if SO₂ was not being added and rather SMBS, you will still get the desired efficiencies. As a result of these new developments, high gas volumes can now be efficiently handled in the iron removal processes for base metals. There are several processes available to destruct cyanide, with the most common process being the INCO method. This processing route includes the destruction of the cyanide in the presence of oxygen and sulphur dioxide. The oxygen is provided through large volumes of air or pure oxygen with sulphur dioxide gas or a solid reagent sodium called metabisulphite. To achieve maximum oxygen utilisation during the treatment process, specialised impellers are developed to yield oxygen utilisation from the compressed air ranging from 20% to 40%. This depends on the percentage of solids in the slurry being treated. When pure oxygen gas is introduced, however, this number could be as high as 80%. When your pregnant liquor solution is contracted with an organic solvent, enough energy is required to prevent the phases from separating. 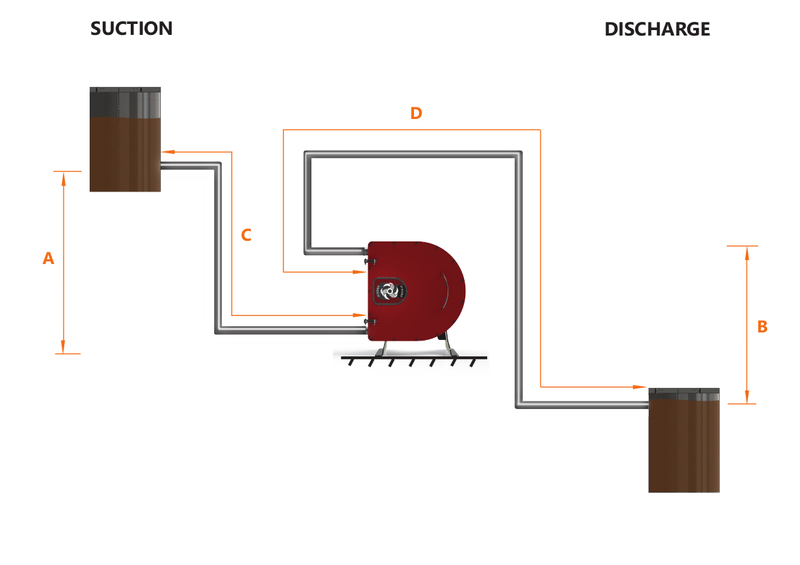 This energy is entered into the system by a pump mixer, when too little energy is entered, the phases will separate. This is clearly evident in SX as the phases separate within the settler naturally and hence SX being referred to as mixer-settlers. The mixers need to create dispersion and not an emulsion, as this would be the result of too much energy. The ideal dispersion is the minimum energy required to maintain a complete dispersion with no pockets of phase separation. Since the surface is the furthest away from the pump, this is the region where phase separation is most probable. This is convenient; because the surface of a mixed box can be seen if the lids are removed. At the minimum power per unit volume for complete dispersion, the droplets are the biggest stable droplets possible. This is ideal if top speed is kept down, to minimise fines and facilitate the separation in the settlers. The minimum power for phase separation has been determined experimentally. The minimum power per unit volume is a function of residence time and the height of the fluid. Tall skinny tanks need more power to resist phase separation than short, squat tanks. This is important to be considered during the design phase of the mix box. The best way to look at the design of the mix box is to determine the maximum possible hydraulic efficiency that can be achieved for the given head and flow and then determines the pump box volume. Apart from the correct pump mixer design consideration being taken into account, we consider all available options when designing the mix box. We can assist with the best tank geometries as well to improve your mixer's efficiency." This unique radial flow impeller is designed for pumper mixer applications. The impeller is designed to discharge the fluid radially outward to the vessel wall. This particular type of radial impeller provides a more informal radial flow pattern when compared to the radial impellers which do not have a disc. The advanced design ensures advanced flow, maximum dispersion, and provides a specified and desired head generation. The curved blade pump turbines offer maximised head and flow while reducing air entrainment through low power consumption. Radial flow impellers are most commonly used in liquid-liquid dispersion applications. The impeller used for the Turbine Mixer or Auxiliary Mixer is the AFX F3 Hydrofoil Impeller. These impellers are designed to deliver high pumping velocity at low power. The F3 is a versatile impeller, suitable for high mixing efficiency in high and low viscosities, increased scouring velocity and low shear rate, making it the ideal mixing impeller. The three-ear hub is keyed to the agitator shaft with the blades bolting onto it, together with the shaft in a single element. 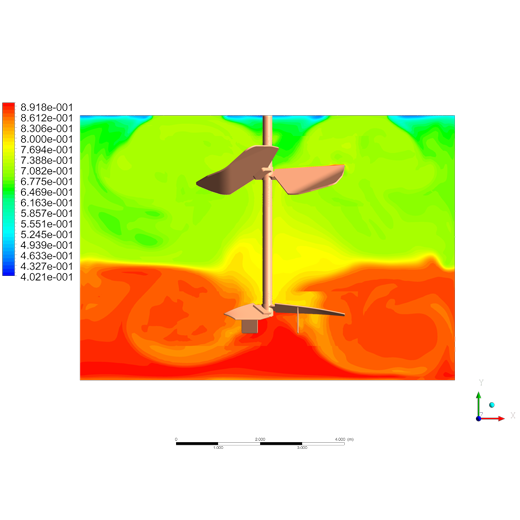 The adjustment allows for movement of the impeller after installation, to avoid phase separation. This impeller is manufactured from 316 stainless steel. Having specific applications and duties throughout various industries, side entry mixers are often used where the installation of top entry mixers may not be possible or feasible. This may be due to tank construction and load limitations, or even area limitations overhead. Although the design of the side entry agitator may sometimes call for larger power installations, the impeller to tank ratio to achieve the desired mixing/blending or suspension pattern is substantially smaller. The impeller power number will therefore not be the same for the top entry impeller, resulting in larger power draws with the side entry unit. This is taken into account when compiling the design for the side entry agitator, resulting in most of the larger side entering mixers being belt driven. Side entry agitators are mainly used in the following applications; however, are not limited to these applications: petrochemical & petroleum, animal & plant oils, food & beverage and pulp & paper industries. In very large storage tanks and vats, the agitator’s main duty is to create a flow pattern ensuring that the liquids within the tanks keep moving, often very light solids or sediment needs to be suspended off the bottom to ensure there is no build-up. These applications require very low power levels in comparison to those which have specific batch blending times which need to be achieved. Pulp & paper agitator designs call for a more specific approach, requiring specific facts and data surrounding the pulp, the blend times, as well as the viscosity and density. Some pulp and paper plants may experience issues where their agitators are tripping or drawing large amounts of power; this may be due to the agitator having been undersized for the duty it was to perform. 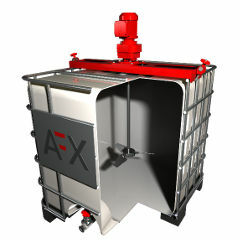 AFX strive to obtain all the facts and data required to correctly size the agitator for the blending application. We also provide technical information as well as support with regards to installation, maintenance, quick repair and assisting with minimising downtime. The need for larger mixers has increased in recent years, mainly due to the industry's requirement to expand operations, or to keep production costs as low as possible. At AFX, we customise our top entry mixers to accommodate your process. Our top entry mixers are available in different technical specifications and can be used for specific purposes across different industries. In the past, large top entry units were more commonplace in the mining industry. However, this trend is now changing with other industries now also requesting larger and more specialised mixers. As agitators become larger, the loading requirements increase considerably, and every component is looked at individually, ensuring it is robust enough to handle the application. 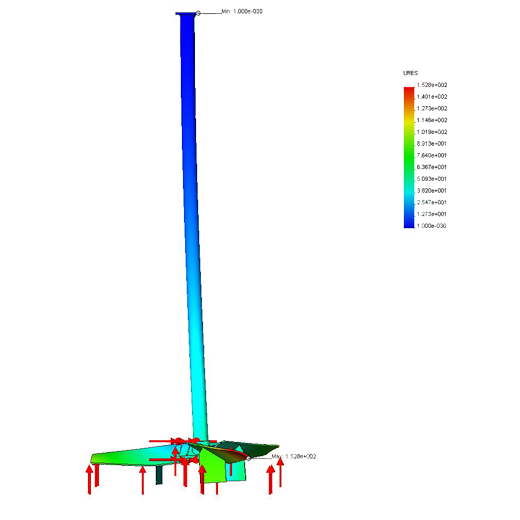 At AFX, all design work is further scrutinised using Finite Element Analysis (FEA) to ensure that failures do not occur. 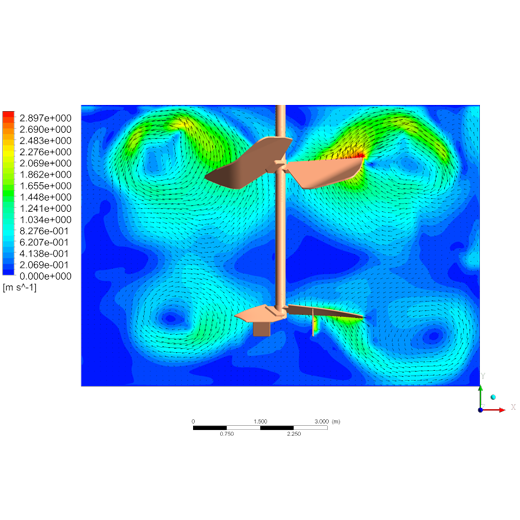 Many companies tend only to use FEA's once they have experienced problems or failures. 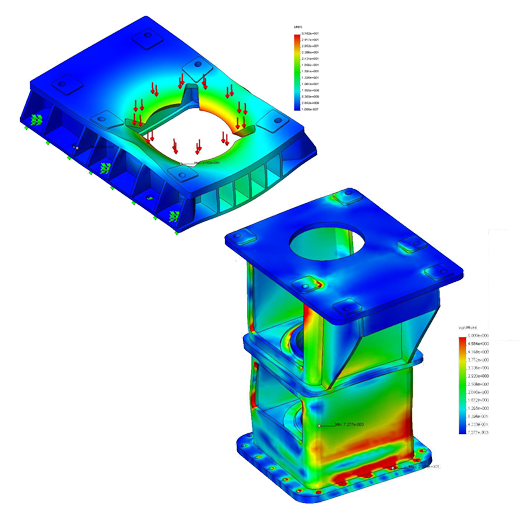 We use FEA's and our design know-how to avoid problems before they happen. On our larger agitators, gearboxes are designed to incorporate a dry well and heavy-duty output bearings. In the majority of instances, we also allow for an extended bearing distance. Normally, gearboxes are selected on torque alone, but with agitators, the overhung load is large, and the drive is subjected to high external loads. Our selection, therefore, doesn't only cater for the transmission of power, but also its ability to withstand external forces. With tanks being larger, the structures the agitator needs to mount onto becomes more susceptible to inaccuracies and misalignment. With the intention of saving costs, many manufacturers allow their gearboxes to be bolted directly onto faulty beam structures. By mounting a machined gearbox directly onto a fabricated structure, it preloads the housing. This causes additional stress within the housing itself. During operation, this misalignment, combined with any twisting of the beams, will cause premature casing failure. AFX-designed gearbox bases have machine mounting surfaces that don't need shimming and won't preload the gearbox casing. Bases are designed to withstand much greater loads than what the agitator is subjected to. This enables the base to increase the rigidity of the structure.